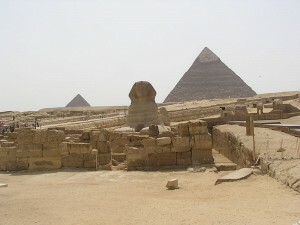 There are many tourist attractions all over the world, but none of them are quite as amazing as the pyramids of Egypt. They are a spectacular sight and hold much mystery. They stand tall over Egypt and are made with tons of stone. The idea of our great ancestors making such a monument is hard to process. These stones are made of materials that were often brought from many miles away. It would have been a long tough move for the builders. The stones were also made of things such as straw and mud bound together to make blocks. This took a long time because after you mixed them together they still had to dry. The drying process of the stones took a long time. Then they had to move these stones up the side of the pyramids. To do that would have taken a lot of men that just were not available. It would have taken hundreds of slaves to make such an enormous structure. These pyramids served different purposes in our civilization. 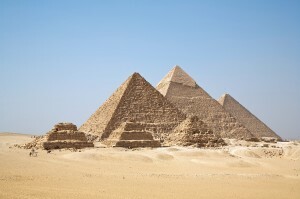 The most important reason for building pyramids was to bury the pharaohs. Pharaohs ruled the lands of Egypt for thousands of years. There were some great pharaohs and then some very cruel pharaohs. They all had a special ritual for being buried, the great pyramids. All rulers received a huge burial with many different artifacts buried with them. Some of these artifacts were gold, trinkets, and drawings. They were usually buried with lots of gold to represent there great wealth and prosperity. In the old days, the better the pharaoh, the bigger the burial. Each pyramid contained a burial chamber. This was the place that no one ever entered but the dead pharaoh. It was a sacred place. No living person was allowed to enter. This is also the room that the gold and trinkets were buried in. They had to protect the great artifacts from thieves and tomb raiders. Thieves would pilfer through the tombs and take all of the beautiful artifacts and the ones that are worth money. The great pyramids had guards that would stand around the clock with the pharaoh’s body to make sure the tomb raiders did not get anything of value. This went on for many years. In those days if the pharaoh was cruel than he would get no treasure in his tomb. One of the most interesting things about pyramids was there drawings. The drawings depicted the pharaoh’s life and what course he chose to take. The confusing part of some of these drawings was the alien figures. Many of the drawings depicted large eyed men that visited on flying saucers from the sky. Is this a coincidence to the stories we hear today? Aliens could have been depicted as God if you read the stories from the Bible. These stories often had the same resemblance. Pyramids are mysterious places that we may never know all of the answers to. Our ancestors left no writings to explain these structures. Ancient alien hunters are still looking for the connection between aliens and the pyramids.